Paul Pogba wants a new lucrative deal amid interest from Real Madrid. During the previous international break, the France international sparked speculation surrounding his future by admitting that he dreams of playing for Real Madrid. Multiple sources from across the continent have since run with this story, with their own versions of reports linking the star midfielder with a mega switch to the Bernabeu. 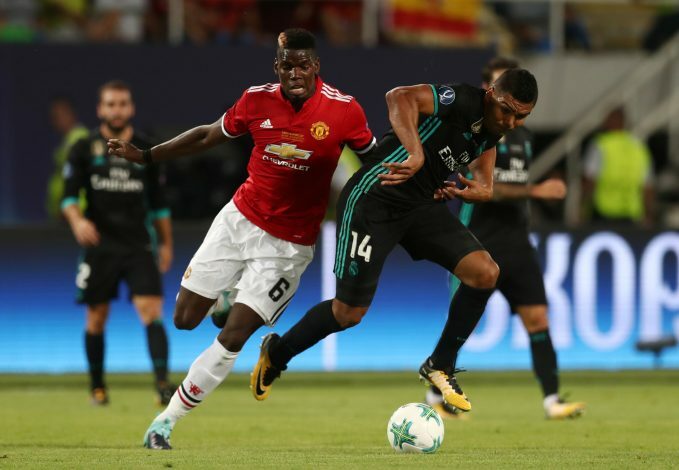 Those speculative reports were as good as validated by Los Blancos gaffer Zinedine Zidane, who recently stated he likes Pogba a lot, and that if the 26-year-old ever departs from Old Trafford, Real Madrid would be the next obvious destination. Amid the sheer uncertainty surrounding the Frenchman’s future at Manchester United, newly emerging reports have indicated that the player is now looking to secure a brand new deal with his current club. According to The Sun, Pogba has been left ‘flattered’ by the interest from Real Madrid. However, he is still willing to extend his stay in England, provided the Red Devils offer him eye-watering wages worth £500,000-per-week. If these salary demands are met, Pogba’s current wages of £300,000-per-week would see a dramatic increase, taking him on par with Alexis Sanchez as the highest paid player at the Theatre of Dreams. With the midfielder in high demand, agent Mino Raiola is expected to push for as lucrative a deal as possible once the negotiations are underway. And if no agreement is reached, it wouldn’t be a surprise if the World Cup winner finally gets his dream transfer to Madrid in the near future.